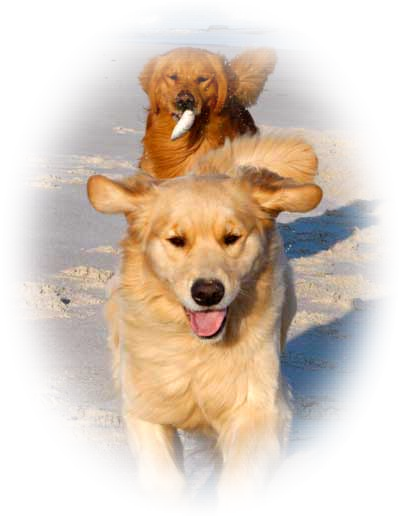 Welcome to Kalm Sea Golden Retrievers. We are located in the country area of south central New Jersey, within easy reach of Pennsylvania, New York, Delaware and Maryland. Growing up in England we always had four or five dogs. They were part of our life and my parents bred our dogs occasionally. My dream was that one day I would be able to have a small hobby kennel with my own dogs to show and breed. How lucky, my dream came true. Since the late 80’s we have been committed to producing beautiful healthy dogs with sound structure and the true Golden Retriever temperament as required by the standard of the Golden Retriever Club of America. They are intelligent, bright, versatile and loving family pets who will play with the children, be at your side at home, go out in the field as a working retriever, compete in the show ring, enjoy obedience, agility, tracking, and give comfort as therapy dogs. To us they are the perfect dog and wonderful family companions. 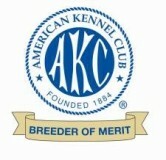 Our dogs have competed and become champions in the breed ring, titled in obedience, agility and field. We have produced therapy dogs, assistance dogs, a top certified Search and Rescue dog, a diabetes detection dog and most of all, loving family pets. Our puppies are raised and socialized in our home until the day they leave with their new families. Goldens are sporting dogs and as such do need exercise. 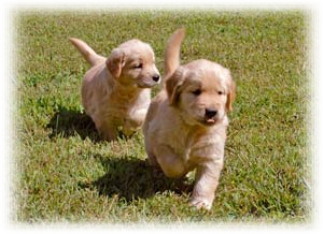 They love to play, are happy bouncy puppies, and need to learn manners. They thrive on a happy life where they can join in the fun, enjoy the company, and be an active member of the family. Our breeding dogs have the recognized health clearances, hips, elbows, heart and eyes. 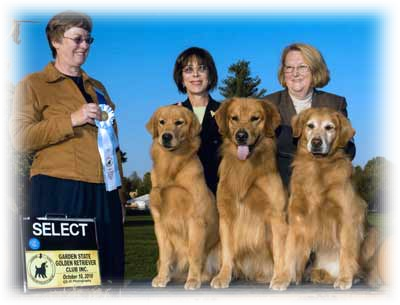 We abide by the Golden Retriever Club of America’s code of ethics and are an American Kennel Club Breeder of Merit. Our dogs enjoy running on the beach and playing with the clamshells! All content including photographs on this site is copyright © Susan Robins.